The WIRTH project, which is a group of researchers and their relatives whose Y-DNA belongs to the J2a4 haplogroup, is about to construct a phylogenetic tree of all the men in the project, showing how they are related to each other, and more important, when the different branches of the tree split off. We know that all the men in the Bacharach and WIRTH projects are related to each other. We think their shared common male ancestor lived some time in the middle ages. However, some people are more closely related. Their common ancestor might have lived in the 1600s or even more recently. This is what the tree will show in a graphic representation. We all know that DNA mutates from time to time. The mutations occur randomly, but there are statistical models for how frequently this happens, so a geneticist can take a large group of data and construct a model showing the likely times of the various mutations. This helps show who is most closely related to whom. Here’s a super-simplified example: If your great-great-grandfather had four sons, they all inherited his Y-DNA. Because of random mutations, one or more of them could have a slight difference from their father and their brothers. Let’s use colors to illustrate this. Suppose one’s Y-DNA consisted of four colors, and your great-great-grandfather had a pattern of RED–RED–GREEN–GREEN–BLUE–PURPLE (not exactly how this works, but just a simple analogy). All four of his sons would inherit the same pattern, unless, randomly, one changed (not a frequent occurrence, but random). Suppose Son#1 had a mutation so that his pattern was RED–RED–GREEN–BLUE–BLUE–PURPLE but the other three sons had the original pattern. From that point forward, all male descendants of Son#1 would have the new pattern, with 2 blues instead of 2 greens. They’re all still descendants of the great-great-grandfather, but their DNA has a slight difference. Because of where the difference occurs and how great the difference is, a geneticist can make an estimate of which generation that mutation occurred in. If we compare two descendants from two different branches in a later generation, even if we have no paper trail, we can look at which mutations they share and which mutations they don’t share and estimate how long ago their most recent common ancestor (MRCA) lived. This is especially useful for those who don’t have a very long paper trail. Any Bacharach/Bachrach descendant, with the surname, who has not been tested should order a test while FamilyTree DNA is running a special (get 67 markers and then we’ll need an upgrade to 111). If you need financial help to afford the test, please contact us. 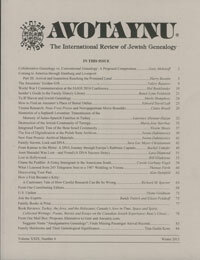 The International Association of Jewish Genealogical Societies Conference 2012 is in Paris in July. I’ll be there, along with co-researcher Janet Akaha who will be making a presentation about the Frankfurt Jewish DNA project. The project traces the paper trail of the Jewish families of Frankfurt from the middle ages and connects the DNA connections between these families. Bacharach is one of those early families. So far in our Frankfurt or Bacharach projects we don’t have any participants who can trace their ancestry to medieval Frankfurt. Janet and I are actively seeking males with that DNA (last name Bacharach/Bachrach or variants with a family tree back to Frankfurt). If we can find someone, we can establish whether the other Bacharach families from all over Europe have a common ancestor with the documented families from Frankfurt. This would be a very exciting development. After the conference, I’ll post more here about the Frankfurt project and what it means to the modern-day Bacharachs and their possible connection to very old rabbinic dynasties. FTDNA is offering tests at a sale price until the end of the year. Y-37 for $119 (regularly $169) and Y-67 at $199 (regularly $268). If you or anyone you know is male and has a surname similar to Bacharach, please join our project by clicking this link. If you’ve already been tested for the National Geographic project, we can transfer your results. I just got a notification from FTDNA–from June 5-June 25, the prices for Y-DNA tests ordered through a project are Y-DNA67 for $199 (Regular price would be $239) or Y-DNA37 for $119 (Regular price would be $149), so now’s the time to do it if you’ve been thinking about it. If you want to do the test but can’t afford it, get in touch with us. We’ll try to get others to chip in for the cost. And if you don’t have the right DNA for the test, but want to sponsor someone else’s test (especially if you have a close relative who can be your “surrogate”) you can make a contribution to the testing fund. Don’t wait. The prices will go back up at the end of June. We’re still waiting for additional testing results, but in the meantime I’ve created a chart to show a simplified version of the matches. The colored squares show the markers that don’t match. The computer looks at all the samples, and for each marker it figures out what the most common value is. If most of the samples have a 12 in the first spot (which all the Bacharachs do), then that is the most common value or “Modal” value. The “Mode” is listed across the top. Any place where an individual differs from the mode will show up as a color. This is the easiest way to see where participants vary from each other. If one individual has all white squares, he matches the mode 100%. If another has one colored square, he has a genetic difference of one from both the mode and the individual who matches the mode. By looking at where the colored squares are, it’s possible to see how closely the individuals within the group match each other. The chart below shows ONLY the markers where all Bacharach participants don’t match. The additional columns have been stripped away to simplify the chart. 1. Kestrich and Hattenbach, which are geographically close to each other, share a value of 34 on CDYa. The others have 33 in that location. 2. Slonim and Rhuzany, in Belarus, match 100%. They are also close to each other geographically. If we can get more data, there will be more patterns showing the geographical relationships and how the family migrated across Europe. We’re waiting on the family tree information for the latest test results, but the general geographic origin is Belarus/Poland. This individual is a 25/25 match with several others in the project and 24/25 with everybody else. We’re still waiting on the rest of the 37 markers. The most important result: the extra copies of DYS464 (see the DNA Results page above for an explanation). So far we are 100% matching, every participant. Far beyond our expectations. We still need more family tree information to tie all these branches together, so if you have any part of a Bacharach/Bachrach family tree going back to anywhere in Europe, please contact me. This participant’s family emigrated to the US most recently from Brest, which is now in Belarus. We’re anxiously awaiting the rest of the 67 markers. I’ve added a map of the earliest known ancestors of the matching DNA, as well as a map of all the known locations of Bacharach/Bachrach families in the Hesse/Thuringen area in the 1700s and 1800s. I’ve also created family trees of some of the Bacharach families, beginning with the oldest known and including 3-4 generations, depending upon the size of the family. The charts are grouped geographically and can be accessed by pulling down the “Family Trees” tab at the top of the page. Most of these trees end in the mid-to-late 1800s in order to protect privacy and also keep the charts from being too large. It should be enough information to locate a family. If you’re related to one of these families and want more information, contact me and I can put you in touch with researchers from that branch. I will continue to add data as it comes in.